Jeep Grand Cherokee Trackhawk: May I Borrow that Hellcat Engine? 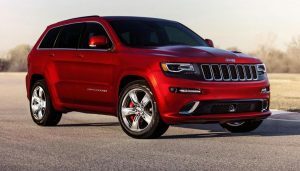 The Jeep Grand Cherokee Trackhawk is what happens when a Dodge Hellcat marries one of the world’s most popular SUVs. The 2018 Jeep Grand Cherokee Trackhawk bills itself as the most powerful and quickest SUV. Naturally, there are critics to this claim. Arguments aside, what we do know is that this beast has 707 horsepower under the hood and a top end of 180 mph. And that’s just impressive in and of itself. 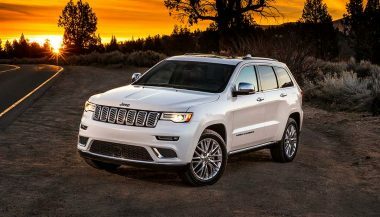 The new 2018 Jeep Grand Cherokee Trackhawk has more in common with the Challenger and Charger than its Jeep Cherokee kin. The Trackhawk sports the 6.2L supercharged Hemi V8, beefed-up TorqFlite eight-speed automatic transmission and reinforced full-time 4WD system. Just for fun, the Trackhawk also has the Dodge Challenger SRT Demon’s Torque Reserve System, so you can load up the family and launch them down a straightaway reaching 60 miles per hour in 3.5 seconds. That’s the same performance as a 2017 Chevy Camaro ZL 1. Suddenly the family Sunday drive has taken on a new perspective. Adding the Hellcat to the Trackhawk was not a simple matter of adjusting a few bolts on the motor mount. Putting 707 horses in an SUV means major modification. 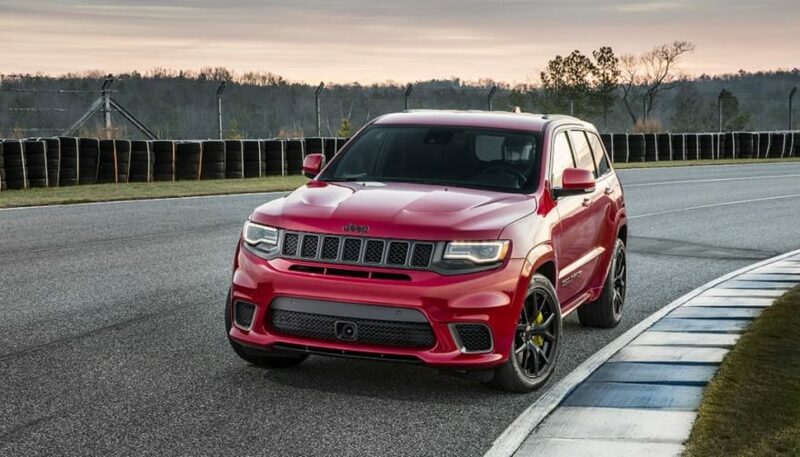 The Trackhawk has almost nothing in common with the standard Grand Cherokee powertrain. The Hellcat-inspired modifications start with a new hood complete with two functional heat extractors. The fog lamps are gone and replaced with vents to provide intake air for the supercharger. The three big slots in the grill and the long slot at the bottom of the grill provide airflow for the radiator and intercooler. When you have a vehicle capable of the amazing acceleration that the Hemi brings, you need to have an effective method to slow it down and bring it to a stop. Brembo is probably the best known brand of “super brakes,” and they have outdone themselves tucked inside the Trackhawk’s 20-inch Titanium finish wheels. Up front 15.75-inch two-piece vented rotors with six-piston calipers do the job. In the back 13.78-inch vented rotors with four-piston calipers provide outstanding stopping performance and heat management. The Brembo system will bring a Trackhawk travelling at 60 mph to a complete stop in 114 feet. That’s impressive. Needless to say the ABS and traction control systems needed to be modified to accommodate this “supercar-like” performance. For bragging rights, thanks to Uconnect Performance Pages you can record and display your 0-to-60 times and seat pinning g-forces. You can also save the data to a USB or really impress your friends by sharing it on Snapchat. Big engine, big torque, big brakes. We are talking about a vehicle with incredible power that seats five, hauls 68.3 cubic feet of cargo and tows 7,200 pounds. Oh, and you can take it off road. Talk about versatility. The Trackhawk has a big impressive engine and equally impressive speed stats. It has optional Ruby Red leather interior and an array of amenities that can make even the most jaded of luxury car owners take notice. 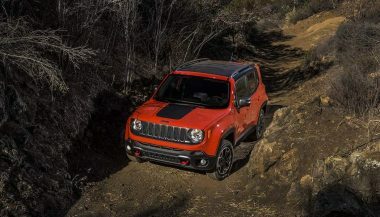 But at its heart the Trackhawk is a Jeep, an off road warrior. 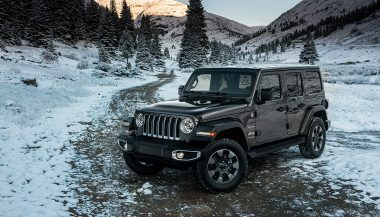 For 2018 Jeep fortified the Trackhawk off road parts and systems. It starts with an upgraded TorqFlite eight-speed automatic transmission. Tweaked to handle the Hellcat’s torque, this computer-controlled shifter will automatically accommodate engine torque gradients, grade changes, and longitudinal and lateral acceleration. Married to TorqFlite is Jeep’s heavily modified on-demand Quadra-Trac 4WD system. With a single speed transfer case, there is no need for driver intervention. No levers to pull, no wheel hubs to lock – just 4WD when you need it. The suspension has also been designed to accept more abuse than before. The front suspension uses both short and long arms with coil springs and adaptive Bilstein dampers. A multi-link suspension design with coil springs comes into play in the rear. The Trackhawk has five drive modes. The adaptive Bilstein dampers play a major role in delivering the ride the driver desires. The most powerful SUV in the world does not have the bad-boy good looks that its two Hellcat cousins have. In fact, the Jeep Grand Cherokee Trackhawk looks pretty respectable. 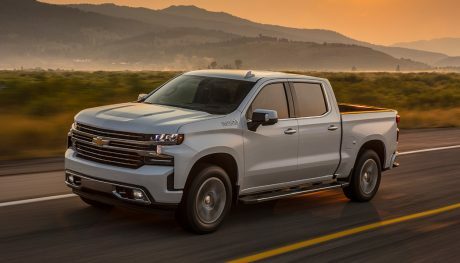 It has a clean design and, with the exception of the air scoops in the hood and the four chrome exhaust tips, there is little outward design that screams I’m faster than you. It can satisfy your inner NASCAR fantasy, or project a respectable image while dropping off the kids at school. Or it can be the outdoor 4×4 toy you have always wanted. Helping drivers live out those fantasies are the Trackhawk’s five different ride modes. Auto mode is for everyday driving, so it adapts to whatever road conditions you encounter. Sport mode quickens gear shifts by 50 percent over Auto mode, and steering, suspension and stability controlled are tuned for more aggressive driving. Track Mode truly is for the track. Shift time is reduced by 68 percent and steering, 4WD and stabilization are set for all out driving. Torque pours 70 percent of the power to the rear wheels and 30 percent to the front. Tow mode makes pulling that fishing boat a bit easier, minimizing trailer sway and suspension bounce. And for those in colder climates, Snow mode is the answer to your winter transportation challenges. Torque is split 50/50. There really is no legitimate reason to build an SUV with this much power, but we are happy that Jeep did. It should hit the showroom sometime in the last quarter of 2017. No price has been announced yet, but we suspect this ride will start somewhere north of $75,000. So with the second most-powerful SUV, the Bentley Bentayga, going for over $200,000, the Jeep Grand Cherokee Trackhawk looks like a bargain.